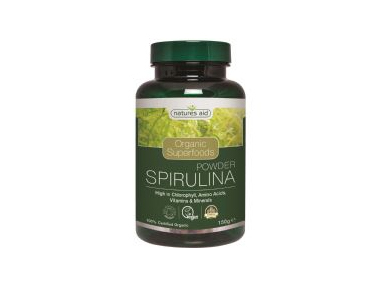 Buy Natures Aid Organic Spirulina Powder - 150g in the UK from our online shop or directly from our independent Scottish store. Organic Spirulina superfood. High in chlorophyll, amino acids, vitamins and minerals. Spirulina (Arthrospira platensis) is a microscopic green algae that is harvested sustainably in freshwater pools on an Island in the South China Sea. Spirulina contains more nutrients than almost any other food on the planet, and is an excellent source of chlorophyll, amino acids, fibre, proteins, vitamins and minerals, making it a modern day “superfood”. 100% Pure Organic Spirulina Powder. As official Natures Aid stockist, we sell genuine Green Foods and Weight Management directly from our shop in Scotland and online throughout the UK. Where can you buy real Spirulina Powder Organic safely online? If you are wondering where you can buy Natures Aid Organic Spirulina Powder - 150g safely online in the UK, then shop with us. We are an actual health foods shop; with real people selling real foods and products. Our award-winning independent shop is located in Stirling, Scotland since 1976. You can buy our Natures Aid nutritional supplements and other genuine Green Foods and Weight Management in store or safely place an order with us online or over the phone. Spirulina Powder Organic - Natures Aid Organic Spirulina Powder - 150g in Green Foods and Weight Management and Herbal Remedies, Tinctures & Supplements.